Yep! She is Free. 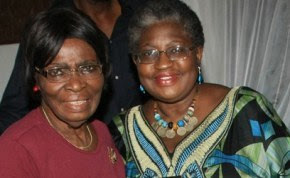 Prof. Kamene Okonjo, Mother of Finance Minister, Dr Ngozi Okonjo-Iweala, who was kidnapped last Sunday has been released.Click here for the Original Post. Shortly following the abduction, a ransom was demanded but it's not clear if the initial request asked for was 1 billion Dollars or Naira. Chei! After several negotiations, it was reported that the ransom was reduced to 200 million Naira. President Jonathan ordered her rescue, as such the team was mobilized and commenced intense search and raids leading to over 60 arrests including 2 policemen. At 10:30 am this morning,Prof Kamane was allegedly dropped her off on the highway near her home in Delta State. According to BBC, Delta State Governor Uduagha said the Kidnappers probably let her go because they were under pressure. Unconfirmed reports suggests that the Finance Minister's Mother has been flown out of the state to recover from the shock of the ordeal and receive medical treatment, however the police has indicated that she will soon be called in for questioning. Now the rumored question is was she really released due to pressure or was the ransom paid?